The kitchen is about 90% painted. I love it. (There is still some cutting in to do, and some trim.) Hopefully S will have some time this week to finish it up, but it's a busy time of year at his job so let's not pressure him too much. I found a 5' steel prep table for our center island on craigslist for a pretty good deal, so S went and picked it up on Saturday. Ideally he'd like a longer one -- 6 or 7 feet -- since we have the space, but we can always sell this one if we find a bargain on the one he really wants. We had to take down and return our range hood to have it replaced (doesn't it just figure? ), as there was an issue with the electrical panel. However, the folks at Proline were super helpful and shipped a replacement almost immediately. Can't beat good customer service. 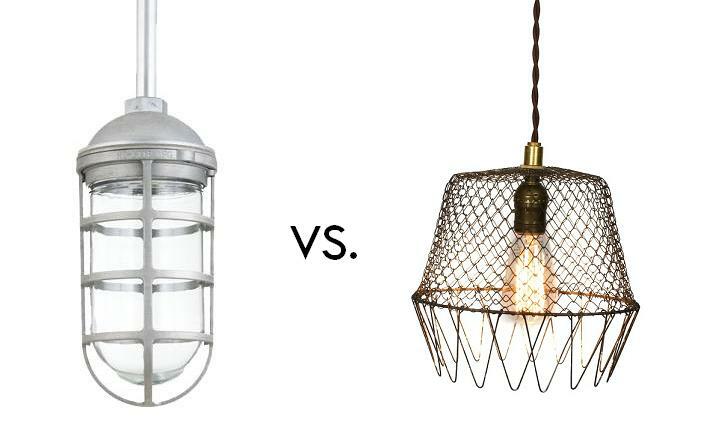 Which light do you like better for our kitchen -- the industrial one from Barn Light Electric, or the rustic one from ﻿Junkyardlighting's etsy shop? I think I'm partial to the junkyard light. It just has so much character! I am torn too. My forst instinct was the industrial one, but the rustic one dooooooees have so much character. Gah! Both neat options. I think the rustic one might help add some warmth to the space? The industrial one is awesome, but feels a bit cold perhaps. Meghan, that's pretty much exactly how I'd describe what's happening in my brain about this. I vote option number 1. I think it goes better with the other fixtures you have picked out, and is a slightly different style, which will contribute to the eclectic look you're working in the kitchen. I agree the industrial one fits much better with the white ones over the island. It is a more classic style IMO. I love them both! And since everything you do ends up being golden to me, I'm excited to see what you choose. How exciting that everything is coming along! Can't wait to see it! ........ The the one on the right is made from a kitchen thing, ..... can't beat that, can you? I'm for the strainer lookin' light, but ya got-a also have the 1940's lookin' bulb. I like the industrial one. However, with either lamp I would be concerned with an open bulb over a work space. I prefer a shaded light that directs the light down and does not draw your attention to the bulb. That may just be a personal preference, however. They both are very cool looking. John Duke, good point. I had the same thought at one point -- but I'm holding out hope that one of these will work. That's why I haven't pulled the plug and bought one yet. I'm going to see what the lighting situation is like when the other lights go in (soon I hope), and then I'll see if I need a more direct option. Hopefully not, but I haven't entirely ruled it out. coming out of google reader lurking to say: the industrial light! the barnyard one is... too barnyard, for me at least. 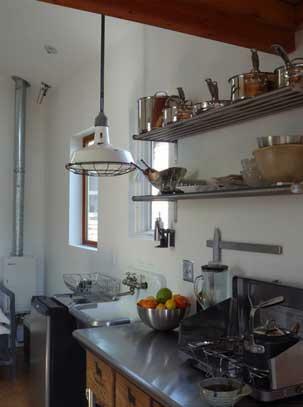 besides, with all the wood and brick and texture in your kitchen, i think you could go 100% industrial in fixtures and still have a great mix. You can make either one for under $50. Thanks for your kindness in attempting to save me some $$$ anonymous! I am a sucker for a deal, that's for sure. I haven't bought anything yet and would love to DIY something but am not sure I have the time. Fortunately we don't do much in a big hurry around here so that might be a possibility at some point!